Unaccompanied minors from Central America migrating to the United States through Texas are making headlines across the country. We asked Donna De Cesare, an Associate Professor of Journalism at the University of Texas at Austin and author of Unsettled/Desasosiego: Children in a World of Gangs (2013), to wade through all the reportage and unpack what she's learned from decades of work with Central American children and gangs. De Cesare has documented a history of repression, violence, and trauma, in which gangs are as much a symptom as a cause of trauma, trapped as they are by social neglect. Here she offers her take on the current crisis and how policymakers in Washington should react. Since June of this year an emergency at the U.S. Mexico border has been unfolding. The most immediate cause is a spike in the numbers of unaccompanied children picked up by the border patrol after making the dangerous and arduous journey from Central America to the United States. But the roots of this humanitarian crisis run much deeper. The stories the children tell involve such shocking violence that The Dart Center for Journalism and Trauma was prompted to publish an online resource for journalists that references my own work of more than twenty years reporting and photographing the impact of gangs, violence, and migration on children living in Central America. Gang violence and organized crime mayhem are major factors in the level of citizen insecurity behind the recent migration trends. Although most news stories have focused on Central American children, it is worth noting that rate of unaccompanied children from Mexico—while lower—is also increasing. A recent report by Mother Jones combines data on the magnitude of the surge in numbers of migrating Central American and Mexican children, discussion of the combination of extreme violence and poverty that these children are fleeing, compelling personal stories, and some discussion of the kind of monitoring and trauma counseling those who are able to stay here will need if they are to thrive. San Salvador, El Salvador, 1989. In the 1980s El Salvador had one of our hemisphere's worst human rights records. during the guerrilla offensive in November. Copyright © Donna De Cesare. From Unsettled / Desasosiego. The crisis and the media coverage have also exposed the fear and fault lines in U.S. communities where emergency shelters for these children are being built. Protestors in Murietta, California, called to mind the ugly confrontations over school busing that plagued U.S. efforts for racial integration of schools in the 1970s. Claims that the Obama administration’s immigration policies are linked to the surge in children seeking asylum have had a polarizing effect on debate. They have little basis in fact, as Carlos Dada, director of the Salvadoran online news service El Faro and one of the best investigative journalists in Central America, can attest. An excellent research study done in El Salvador last fall involving more than 400 child respondents by Fulbright fellow Elizabeth Kennedy, is available at the American Immigration Council resource page. "No Childhood Here: Why Central American Children Are Fleeing Their Homes" provides clear and incontestable data that child migrants are ignorant of Obama administration policies and are leaving because they are terrified to stay at home. To those who say, “If they are refugees, why aren’t they going to Costa Rica?,” the answer is quite simple. Many are going there, too. The UNDP has reported steep spikes in the numbers of unaccompanied minors flooding into Nicaragua, Costa Rica, and Belize from the violence-afflicted nations of Guatemala, Honduras, and El Salvador. The reason that so many more children from those countries choose the life-threatening journey to the United States is that the vast majority of them know someone here. Ever since the Central American civil wars in the 1980s unleashed a flow of migrants fleeing for their lives, the trail has become a well-worn groove and a safety valve response to surges in economic and citizen security crises. El Salvador / Hondoras border, El Poy, El Salvador, 1988.
after leaving the Mesa Grand refugee camp in Hondoras. 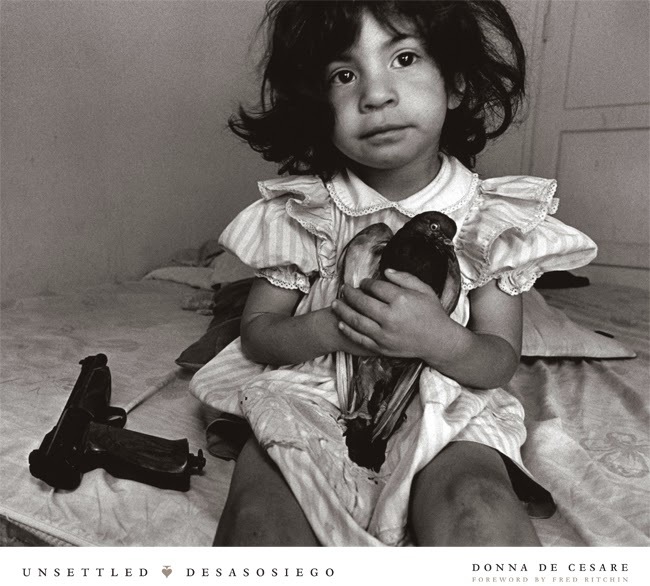 My book Unsettled/Desasosiego published by UT Press in 2013 chronicles the stories of war refugees and describes how deportation policies spread L.A. gangs to Central America. The stories are as chilling as the stories we are hearing from children at the border today. What has changed is that the explosion of crime and violence, related to the inability of the U.S. war on drugs to influence the enormous profits made selling drugs in the U.S. market, has exposed many more children who live in the trafficking nations to a ticking time bomb. It is impossible to make staying at home a safe and desirable option until the violence unleashed by current drug policy failure is addressed. Despite the opportunism and shrill partisanship dominating the debate in Washington over the amount and allocation of funding needed to address the child migrant emergency, for the first time in a very long time the governability woes that have been worsening in Central America have made it onto Washington’s radar. Americans are taking notice. A recent poll published in Newsweek shows that most Americans want to treat the children arriving at our border as refugees. And as I write, Time’s Lightbox blog has published a compelling set of images documenting the exodus of children leaving Honduras—currently the world’s most violent country. Certainly Central American nations bear responsibility for weak and often corrupt state institutions and for failure to make any significant progress on the impunity, which renders their judicial systems more decorative than functional. But many Central American citizens feel they have been held hostage to a drug war designed in Washington that can only exacerbate the levels of violence in the context in which they live. If we in the United States fail to recognize that this humanitarian emergency is a symptom of our own failed vision and drug policies, a crisis that requires a thoughtful collaborative long-term response in partnership with our neighbors to the south, we will ensure an even greater crisis ahead. flee their working-class barrio after three days of aerial bombing and strafing by the Salvadoran air force.